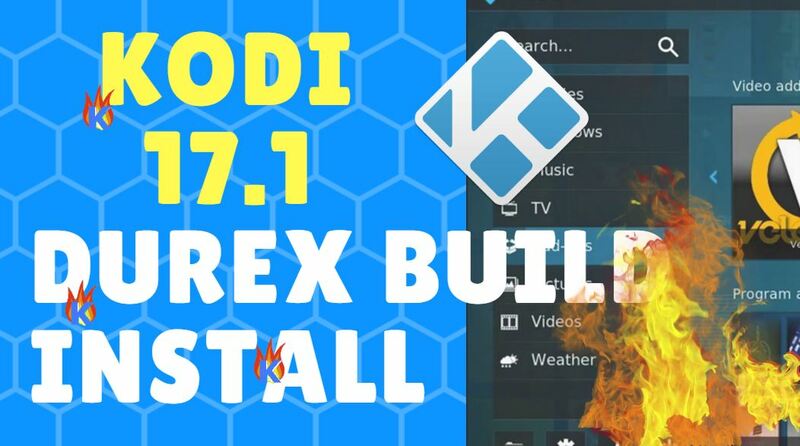 This guide shows you how to install Kodi Durex Build on Kodi 17.1 Krypton or later. What is Durex Build and Why is it Cool? Kodi Durex Build is a favorite Kodi build for many Kodi users due to its impressive assortment of streaming TV addons. It also has a pretty unique 3-row user-interface. The three rows include the standard Kodi menu (the one that has “Add-Ons, Movies, System” etc. ), then a “secondary menu” or sub-menu, and then Durex Build’s third row of buttons, or icons. Hey Amazon FireStick users – Durex Build works great on Fire Stick & Fire TV! So, Kodi 17.1 Durex Build gives us plenty of buttons to press, which is nice. Additionally, Durex automatically pulls the latest movies from Exodus and displays them at the top of the home screen as clickable quick-launch icons. It’s pretty sweet. Keep reading to set it up quickly. Then make sure you protect your data with a Kodi VPN so your ISP can’t sell your Kodi streaming history to third parties. Then turn on Unknown Sources, then press Yes. Enter the file path “http://drxbld.com/wiz” (without the quotations). If that path doesn’t work, try https://archive.org/download/durex_201704/ as an alternative. Now select the box that says “Enter a name for this media source”. Enter a name, such as “durex kfiretv”. Then press OK.
Press OK again to finish adding the new source in Kodi. Then choose the Package icon from the top left corner of the screen. This is the Kodi 17.1 Package Installer icon. Once you see the “Durex add-on enabled” notification in the top right corner, return to the Kodi homescreen. Then go to Add-Ons and select Durex. Then choose Durex Builds or “Build menu” from the Durex Wizard main menu. Then choose (Durex Build) Fresh Install. Press Continue to finish the Kodi 17.1 Durex Build install. After Kodi Durex Build is done downloading & installing, select “Force Close“. Then reboot your device and re-launch Kodi. You’re done! Don’t forget to protect your Internet connection with a Kodi VPN (and unblock your ISP’s Kodi add-on & streaming bandwidth restrictions). Use Durex Build to watch TV shows, movies, IPTV, and other Live TV channels. If Kodi is sluggish after installing Durex, wait at least 5 mintues for all of Durex’s TV addons to update (such as Exodus, SALTS and others). Make sure Durex has finished applying all updates (no more “update” notifications appear). Then re-launch Kodi. Or if you’re using a very low-power device, such as a cheap Android streaming stick, then consider upgrading to a higher-power device. Even old FireSticks run slowly with some Kodi builds. If the streams in Durex Build won’t connect for you, try to install a different Kodi Build like Kodi 17.1 NO LIMITS. Check out the Kodi 17.1 Best Builds list for 2017. If you have the Echo Wizard already installed in Kodi, simply launch it and go to the Kodi community builds section. Then find and select Durex!